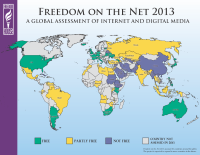 Freedom on the Net 2013 is the fourth report in a series of comprehensive studies of internet freedom around the globe and covers developments in 60 countries that occurred between May 2012 and April 2013. Over 60 researchers, nearly all based in the countries they analyzed, contributed to the project by researching laws and practices relevant to the digital media, testing the accessibility of select websites, and interviewing a wide range of sources, among other research activities. This edition's findings indicate that internet freedom worldwide is in decline, with 34 out of 60 countries assessed in the report experiencing a negative trajectory during the coverage period. Broad surveillance, new laws controlling web content, and growing arrests of social-media users drove this overall decline in internet freedom in the past year. Nonetheless, Freedom on the Net 2013 also found that activists are becoming more effective at raising awareness of emerging threats and, in several cases, have helped forestall new repressive measures.